In this quiet family-camping site de Vossenberg, you will stay in a comfortable little holiday-house with a modern interior. These small holiday-housea and luxurious mobile-homes are spread over a hilly terrain with many trees. It's the ideal place for those who want to flee from big commercial holiday-centres. There are several playgrounds for children and an indoor tennis-court. 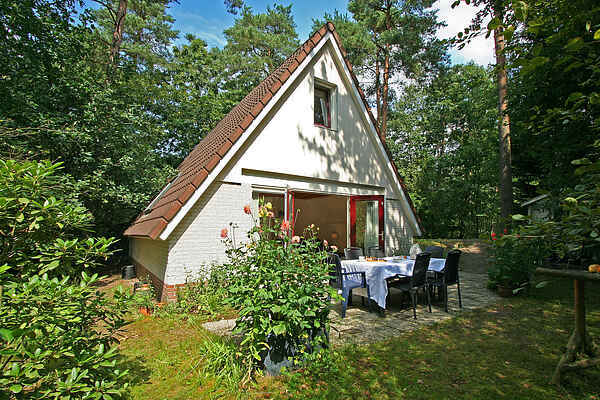 It's in the middle of the woods, but only 5 minutes biking from the village of Nunspeet, where you will not only find numerous small restaurants and shops, but also an Aqualand recreation park and an 18-hole golf course. To finish, the leisure-centre "de Zandenplas", is only 5 minutes biking through the woods.